Little gauchos learn from a young age the values and traditions of their ancestors. The Brazilian state called Rio Grande do Sul has already tried to be independent. There are some people today, who believe that Rio Grande must be a country different from Brazil. In the 17th century, the "great power" of "gauchos" (the term for people born in this part of Brazil) instigated one of the biggest wars of Latin America, the Farrapos War. Churrasco is one of the most typical recipes in southern Brazil. From 1835 to 1845 gaucho soldiers fought against the national military force. The first reason for this guerrilla war was the price of "charque," a kind of dry meat produced in southern Brazil, as well as in Argentina and Uruguay. The Brazilian national government stimulated the foreign product while the national charque was taxed heavily. Even today, it seems like a strange excuse to separate. But after 10 years of fighting, with more than 3,400 people dead, the gauchos lost the battle. This chapter is celebrated on Sept. 20 as "Gaucho's Day" with parties, shows, parades, raids on horseback and lots of food and dance. Specifically, the date of Sept. 20 commemorates the invasion of the gaucho capital, Porto Alegre by Gomes Jardim and Onofre Pires, who led troops of men with guns in hand from Rio Grande do Sul. 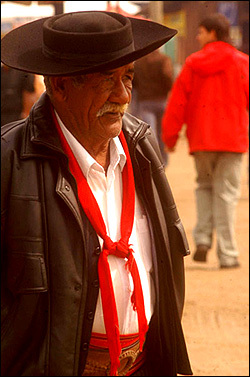 Since 1946 gauchos have celebrated the "Farroupilha Week" in many cities. 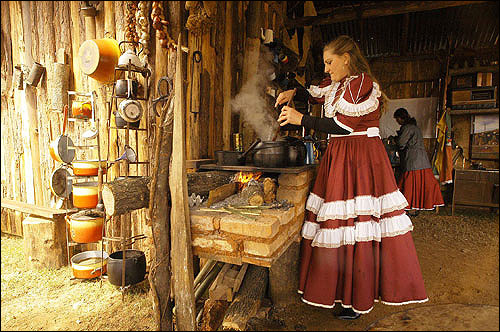 In Porto Alegre the activities happen in Harmonia Park, a large camping area where 700 people stay for 20 days preserving traditions through food, expositions and cultural debates. 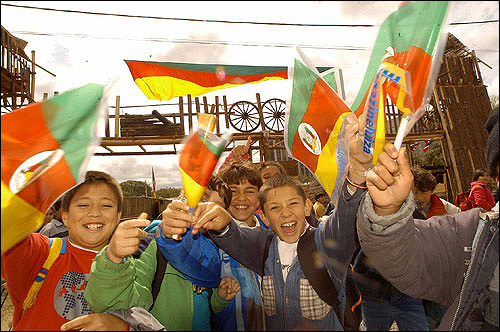 These people usually are from the CTG (Center of Gauchos Traditions). 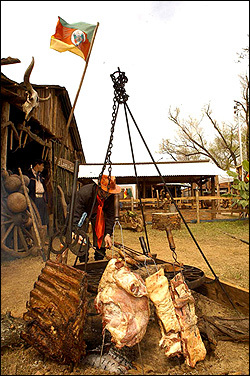 In Rio Grande do Sul alone, there are 1,500 CTGs. In the rest of Brazil, there are another 1,500. Around the world, there are six CTGs in the United States, and others in France, Japan and Portugal. The dresses of women are covered in lace. The camping is open to people to visit all the time. This year, the theme is "Gaucho: uses and customs." Each group who wanted to go camping had to present a cultural project about some aspects of gaucho culture such as cookery, handicrafts or the traditions and history of Rio Grande do Sul. The gauchos were distinctive hats and red handkerchiefs. For food, "churrasco" and "carreteiro" are two most popular recipes. Churrasco is meat baked in live coal on the floor or in structures of clay. Carreteiro is a mix of rice and little cubes of dry meat, usually consumed by workers in farms in the countryside. To drink, nothing more typical than "chimarrao," a drink prepared with a green herb called "mate." Served in "cuia," a container extracted from a tree, chimarrao tastes bitter and is drunk under a very hot temperature. In Harmony Park, there are 77 stores selling products to prepare these traditional gaucho recipes. It's possible to find clothes such as a red handkerchief and wide pants called "bombacha" for men and female dresses decorated with lace. The city hall of Porto Alegre invested 900,000 reais (about US$400,000) to build the camping infrastructure. The expectation is to attract 600,000 visitors. The gauchos like to teach their traditions to their sons very early. Some schools bring their students to learn the routine of gaucho camping. Despite not winning the revolution, Gaucho's Day is still celebrated. People born in Rio Grande do Sul always look to this date with pride as a symbol of the courage and bravery of a people who know how to fight.